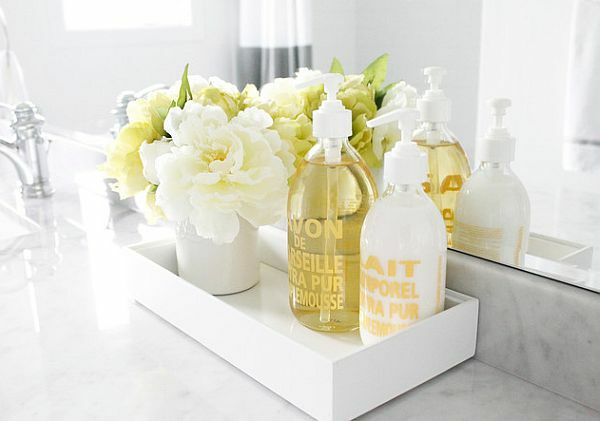 Flowers in the bathroom is one of my favorite places to add some floral fun. They add such a nice little surprise every time you enter. I find that just adding a single bloom in a small glass vase on the sink is all it takes. But of course, you can go bigger and bolder if you have the space. So here is a neutral colored bathroom. You can see on the left near the tub, there are some white hydrangea flowers. They blend in nicely and add a bit of elegance to the space. On the right you can see a vase of bright purple iris. This gives a very different look and feel to the room. Which do you like better? 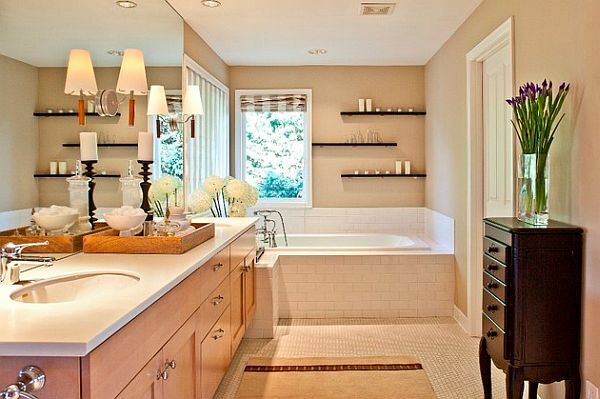 This is a streamlined looking bathroom with clean lines. The white flower arrangement also has streamlined clean lines. Works well together. 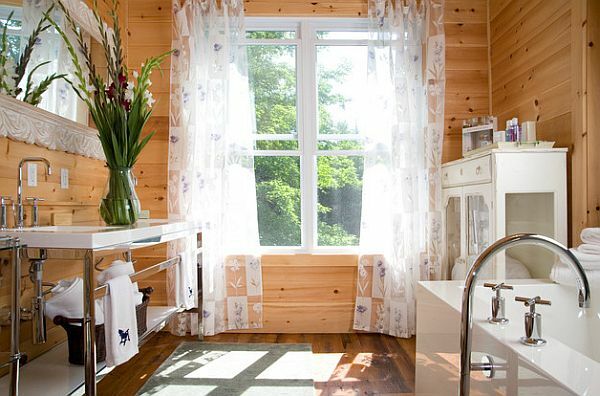 A shabby chic bathroom begs for a vase of fresh blooms. Love these tall gladiolas in the water pitcher vase. Tulips would work well too. 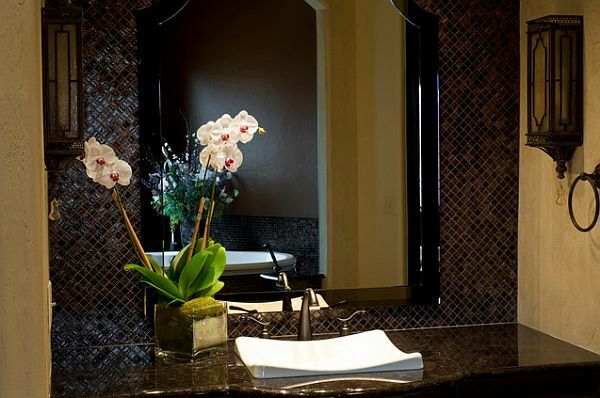 Asian inspired bathroom with asian inspired vase. Zen baby! Tall ceilings can show off tall arrangements beautifully. 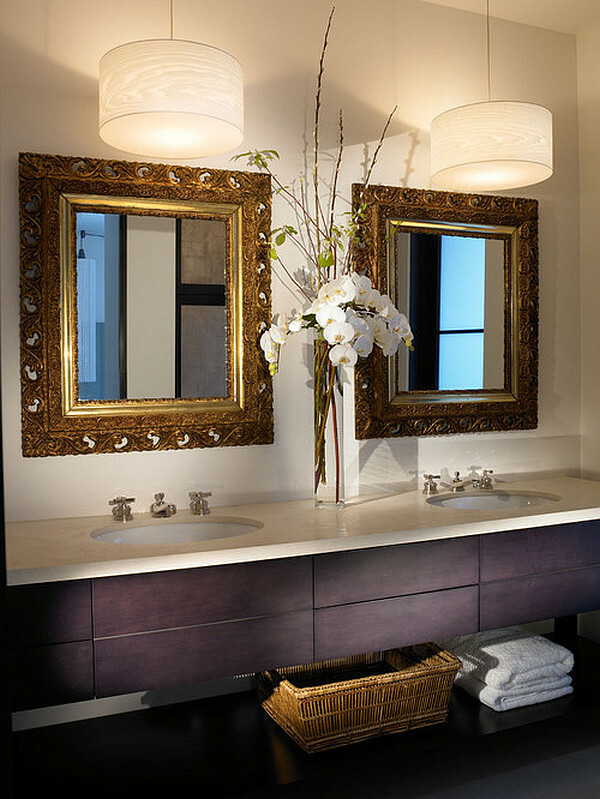 This slender arrangement works perfectly between the two mirrors/sinks and the height brings the eye upward to help take in the whole space. Nice! But just a small tray on the bathroom counter is also a delight. Love how they matched the colors of the flowers to the color of the bottles. So go take a look around in your bathroom. Is there a space that could hold a vase of flowers? If so, add a few blooms and receive a pleasant little surprise every time you (or your guests) enter the room. Tomorrow we will look at tub and shower florals. Ha! Flower power in the shower!